By default, Outlook automatically processes meeting and poll responses so you won't see those emails in your inbox. 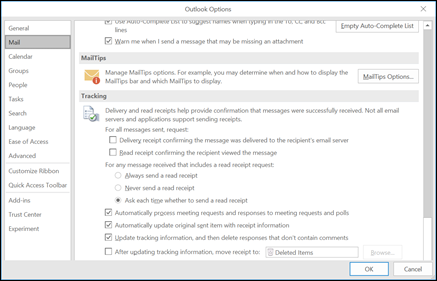 If Outlook doesn't process them automatically, or you want to turn off the automatic processing, use the following steps. Select File > Options > Mail. Scroll down to the Tracking section. Check the Delivery receipt confirming the message was delivered to the recipient's email server box and the Read receipt confirming the recipient viewed the message boxes request a delivery receipt and a read receipt, respectively, for all messages you send. Check the Automatically process meeting requests and responses to meeting requests and polls box to prevent any meeting and poll responses from showing up in your inbox unless an attendee has responded with a comment. All other requests are processed automatically and the original meeting invite is updated to show tracking information. If you clear this checkbox, you'll see a message in your inbox for every attendee's response. Checking the Automatically update original sent item with receipt information will keep track of all read and delivery receipts for items you've sent and allow you to see the status of them by opening the message you sent from your Sent Items folder. Select the Update tracking information, and then delete responses that don’t contain comments check box to update the original meeting request with the response status and then delete any responses that don't contain comments.